Groom Solutions Relax Premium Carpet and Upholstery Protector provides the most advanced C6 technology in fluorochemical technology for enhanced water and oil based soil resistance. The excellent formula creates a better dispersal of solution across the entire area of the carpet being treated. This ensures equal treatment of all sprayed areas and protects your customer against uneven spraying. Relax will provide your customer with an easier and painless spot and spill clean-up. Their carpet will last longer, as the protection reduces carpet wear from abrasive soling, especially in high traffic areas. Subsequent vacuuming will be easier, faster, and more efficient. 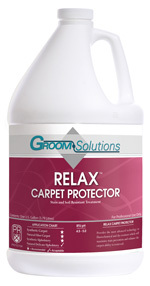 Groom Solutions Relax will leave their carpet cleaner, brighter, and fresher. Because it uses the latest C6 polymer technology, it is safe for children and pets when used and applied as directed, and the most environmentally conscious protector on the market. maintaining 35 to 50 psi with an 8004 TeeJet nozzle. Apply evenly over entire carpet surface. Brush or rake the carpet. 3. Coverage: 200 to 400* sq ft per diluted gallon for damp or dry carpet. ft., low pile commercial requires 1 gal per 400 sq ft.
4. If accidental freezing occurs, allow thawing at room temperature, then shake vigorously.